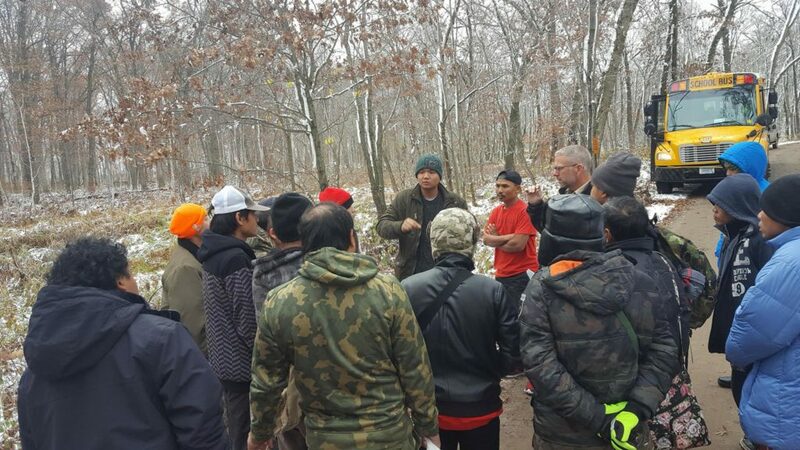 Although the weather was crisp on the last Saturday of October, our Community Educator for Outreach with the Department of Natural Resources, Every Gyi, took a group of about 40 on a field trip to the Carlos Avery Wildlife Management Area (WMA) just north of the Metro. 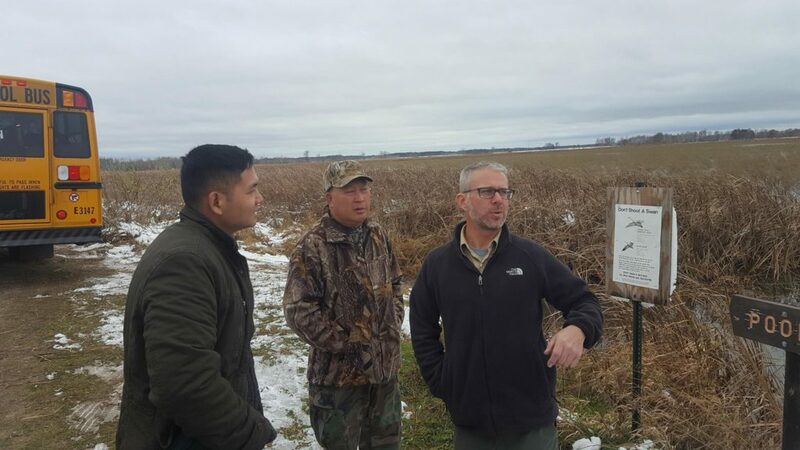 The group of Karen interested in hunting was able to explore the area, learn about the area’s natural habitat and various species, and understand the area’s hunting laws. Every Gyi was determined to get as many participants as he could, so, understanding the needs for transportation, he made sure to offer rides. After about five trips, they arrived at the parking lot where they waited for the bus that would transport them to Carlos Avery. After arriving at the Carlos Avery WMA Headquarters, they headed out for a tour of the area on the bus. On the tour, they were led by Carlos Avery Wildlife Supervisor Jim LaBarre, who showed them the difference between hunting land and sanctuary land, where hunting is not allowed. He talked about the various species that are found in that area, including the most popularly hunted species: ducks. Jim LaBarre also explained which types of shotguns and rifles are allowed in the Wildlife Management Area. Every Gyi explaining in Karen. Every Gyi said that many people had questions on the tour, and at the end of the trip, 15 people had put their names down for wanting to receive their firearm safety certificate. “I’m really happy about the number of people who showed up. Because the weather got so cold, I wasn’t sure if many people were still going to come, so when 40 came I was so happy. The trip was worth it,” concluded Every. The number of participants interested in getting their firearm safety certificate gives reality to the hopes of Every Gyi and Tong Vang, a community liaison from the Department of Natural Resources, in starting up a class for Karen who want to get their certification. Carlos Avery Wildlife Supervisor, KOM Staff and field trip participants.